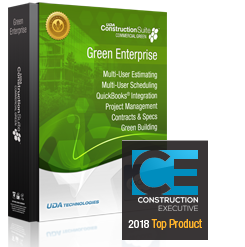 UDA ConstructionSuite CM Enterprise is the culmination of advanced networking capabilities and the industry�s most comprehensive information management system. Give your employees the power to take control of their projects and contacts with upgraded Estimating, QuickBooks Integration, Scheduling, and Contracts, combined with the new Items Database, Integrated Calendar, Resource Allocation, Change Order Management, CAD Integration, Insurance Tracking, Workflows, Application for Payment, Lead Tracking, Cash Flow Reporting, and tools for Property Development. ConstructionSuite, Priority Support, Training, and Upgrades. Learn more. TotalCare Select Optional TotalCare Coverage ---------------------------- Basic Support (30 Days Phone & 1 Year Email Support) ............................. TotalCare Options (Priority Phone Support, Online Training, and Upgrades) Monthly TotalCare Plan for 5 Users - Add $329.99 per month Prepaid 12-Month TotalCare Plan for 5 Users - Add $2999.99 per year ............................. 10 User TotalCare Options (Priority Phone Support, Online Training, and Upgrades) Monthly TotalCare Plan for 10 Licenses - Add $649.99 per month Prepaid 12-Month TotalCare Plan for 10 Licenses - Add $5899.99 per year ............................. 25 User TotalCare Options (Priority Phone Support, Online Training, and Upgrades) Monthly TotalCare Plan for 25 Users - Add $1399.99 per month Prepaid 12-Month TotalCare Plan for 25 Users - Add $12,499.99 per year ............................. NOTE: Monthly TotalCare Support and Membership Plans are billed monthly and can be discontinued at any time. Prepaid TotalCare service will bill monthly after the first year. ConstructionOnline Select Optional ConstructionOnline Account ---------------------------- Monthly ConstructionOnline Pro Subscription - 3 Pro Users - $75.00 per month Monthly ConstructionOnline Pro Subscription - 4 Pro Users - $100.00 per month Monthly ConstructionOnline Pro Subscription - 5 Pro Users - $125.00 per month Monthly ConstructionOnline Pro Subscription - 6 Pro Users - $150.00 per month Monthly ConstructionOnline Pro Subscription - 7 Pro Users - $175.00 per month Monthly ConstructionOnline Pro Subscription - 8 Pro Users - $200.00 per month Monthly ConstructionOnline Pro Subscription - 9 Pro Users - $225.00 per month Monthly ConstructionOnline Enterprise Subscription - Unlimited Pro Users - $250.00 per month ---------------------------- Yearly ConstructionOnline Pro Subscription - 3 Pro Users - $750.00 with Free Setup (Save $150) Yearly ConstructionOnline Pro Subscription - 4 Pro Users - $1000.00 with Free Setup (Save $200) Yearly ConstructionOnline Pro Subscription - 5 Pro Users - $1250.00 with Free Setup (Save $250) Yearly ConstructionOnline Pro Subscription - 6 Pro Users - $1500.00 with Free Setup (Save $300) Yearly ConstructionOnline Pro Subscription - 7 Pro Users - $1750.00 with Free Setup (Save $350) Yearly ConstructionOnline Pro Subscription - 8 Pro Users - $2000.00 with Free Setup (Save $400) Yearly ConstructionOnline Pro Subscription - 9 Pro Users - $2250.00 with Free Setup (Save $450) Yearly ConstructionOnline Enterprise Subscription - Unlimited Pro Users - $2500.00 with Free Setup (Save $500) ---------------------------- NOTE: Monthly Plans are billed monthly and can be discontinued at any time. Yearly Pre-Paid subscriptions will bill monthly after the first year.